In a few weeks' time, my friend Anthony is having a party. It's not his birthday, but he is celebrating the fact that he's alive. He and his friends will get together to mark the one-year anniversary of the day he almost died, but didn't: an Alive Day party. Among wounded vets, such celebrations aren't uncommon ("It sounds like pretty much every Jewish holiday," I joked to Anthony when he told me about his plan. "They tried to kill us, they failed, let's eat"). Almost a year ago, Anthony stepped on an IED while out on patrol in Kandahar Province. Technically, he died that day: he flat-lined twice in the helicopter that lifted him out of the explosion site, but he came back. For that, I am profoundly grateful every day. He lost one of his legs below the knee in the blast, and has spent the last year in and out of surgery, learning to use a series of increasingly sophisticated prostheses, and building up his strength again. Like most people who were fortunate enough to not have loved ones in harm’s way yesterday, I sat in shock at the news out of Boston. I scrolled through my Twitter feed with the kind of disgust and disbelief, that mingled fear and sadness that has become sickeningly familiar to Americans of late. I didn’t rage and I didn’t cry; I just sat there, reading and watching. And then I heard the news of marathon runners sustaining serious injuries to their lower extremities, the report from Mass General that several amputations had been performed. People losing calves, and feet. Men and women who had just run a marathon, who run every single day, who have honed their bodies into world-class athletic machines, suddenly without feet, or living without a leg. For reasons I can't explain, it was that thought that broke my heart. Perhaps it was because I grew up on the balance beam and at the ballet barre, reveling in the things my body could do. I've never run a marathon—never come close—but I know what it feels like to command your body to do something that seems impossible, to gradually, determinedly coax it, correcting an angle here and a foot placement there until finally, your body does what your mind has decided it will do. And though I never injured myself in a catastrophic way, I did, over time, lose that capacity. Bits of my body gave out, until I could no longer issue the same commands. It simply wouldn't cooperate, and I grieved the loss. The news of marathon runners suddenly robbed of the ability to do what they do brought back that grief. And then I thought about Anthony, and about the last year of his life. I thought about how hard he worked to master his various prosthetic limbs, his determination through rehab. I remembered him telling me, the first time I saw him after his injury, when he was still on crutches, that now he wanted to run a marathon. I thought about the day I burst into tears watching a video of him running around a gym on his new prostheses. In the background, you hear the trainer say, "Okay, run a lap." Anthony runs three. Unlike Anthony, those runners didn't sign up knowing there was a risk of explosions. And unlike Anthony, they won't have access to the kind of high-level and long-term medical care that many soldiers and veterans receive. But many of them will be able to walk again. Many of them will be able to run again. That's in part because—and there's no way around this ethical discomfort—they're citizens of a country that has for a decade been sending troops to a battleground where these kinds of injuries are incredibly common. We've become very good at treating this kind of damage to the human body, and we've become very good at teaching people to adapt to life after that damage. Those advances have been achieved as a result of questionable foreign policy choices. But on a day like today, I feel inescapable gratitude that they have been achieved. 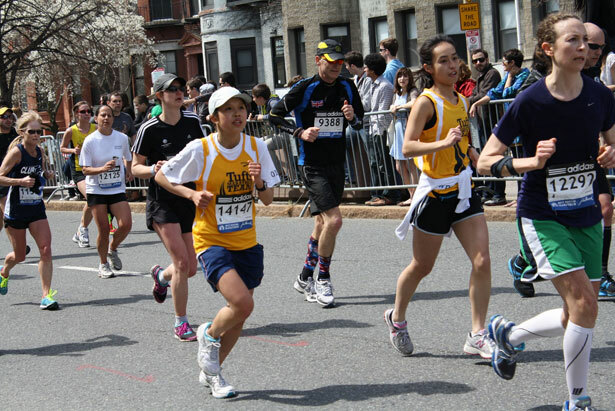 Running a marathon, it hardly bears noting, requires an extraordinary level of determination. It requires a kind of self-discipline and a force of will that most of us, even those of us who have been elite athletes, have only glimpsed in ourselves. So too does recovery from the kinds of life-changing injuries that were sustained in Boston yesterday. Rehab is hard, painful, miserable work. But those runners, I suspect, will run again. They'll run another marathon. They might even run three. Read Dave Zirin on why Monday's bombing is a tragedy that the Boston Marathon—and the strength of spirit on display there—will overcome.